Fish Creek habitat is comprised of three different layers of plants. Each layer is made up of plants that grow to certain heights. The layers are called the canopy, the understorey and the groundcover. Each plant layer helps to keep the other plant layers healthy. Certain animals only like to live in one layer of plants. The three layers of plants provide different kinds and types of food all year round for the animals that live there, including flowers, seeds and leaves. Some animals like to live in one layer of plants while they feed in another. The different layers of plants allow animals to safely move about from one layer to the next. Plants that grow in each of the three layers have different root depths. Together these different layers of roots help to keep the soil stable and healthy. The three layers of plants are able to capture, store and use energy. When this happens, living systems grow. Fish Creek is being restored by removing weeds and planting local native groundcover, understorey and canopy plants. Why should we use local, native plants to restore Fish Creek? We are using native plants to restore Fish Creek habitat because Australian animals prefer to eat and live in Australian plants. Native plants are also highly suited to growing well in our local environmental conditions. Using native plants that come from around our local area is also important. This is because it helps to make sure our local environment remains healthy. It also helps to maintain our ecosystem’s biodiversity. Some types of native plants grow in many different areas and regions across Australia. For example, a river bottlebrush tree may grow naturally in New South Wales and the same type of tree will also grow in The Gap, South East Queensland. In other words, it is the same type of plant but it is growing in two different areas. When groups of plants grow in different areas they will often change slightly. This change (also called ‘adaptation’) is so the plant can be as healthy as possible in its local conditions and environment. These slight adaptations help the same type (species) of plant to be healthy in different environments and regions. Groups of plants in an area that have local, genetic differences from plants that live in other areas are called provenances. It is important to preserve different provenances, because every provenance is special and unique. These genetic differences help to make sure ecosystems all over the word remain diverse and healthy. People all around The Gap local community are planting locally sourced trees, shrubs and groundcovers to make sure Fish Creek’s provenance stays healthy for many years to come. The canopy is the tallest part of a habitat. It is made up of all the overlapping branches and leaves of trees. The canopy layer often starts at around 6m high and can sometimes reach upwards of 50m above the ground. Canopy plants play a very important role in helping to keep waterways like Fish Creek healthy. Canopy plants provide shade and shelter for the delicate leaves of plants growing below. They may also provide a home for animals that live amongst the branches. Shade from the canopy helps to keep the water in the creek nice and cool. Leaf matter that falls from the canopy into the creek provide an important source of food and shelter for fish and other animals that live in the water. 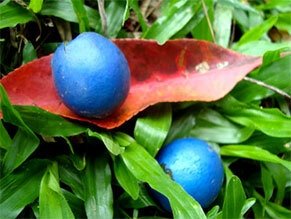 The blue quandong is a large tree that can grow to around 35 – 40 metres tall. Living in sub-tropical rainforests and along moist, scrubby watercourses, this tree bears bitter, edible blue fruit from September thru November. Several different species of birds eat the fruit of this tree including the cassowary, Australia’s heaviest flightless bird that lives in North Eastern Queensland. The Lacebark Tree is a medium sized tree that quickly grows in rainforests from central New South Wales up into southern Queensland. The tree’s latin name – ‘dis’ meaning unlike and ‘color’ meaning colour, refers to the contrast between the dark green colour on the upper leaf’s surface and the pale leaf colour on the underside leaf surface. 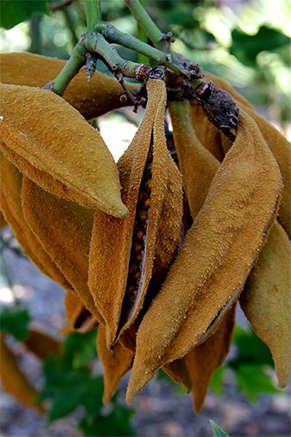 Indigenous Australians used the wood of lacebark tree to make handshields, the bark to make dillybags and roasted the seeds for a nutty flavoured snack. 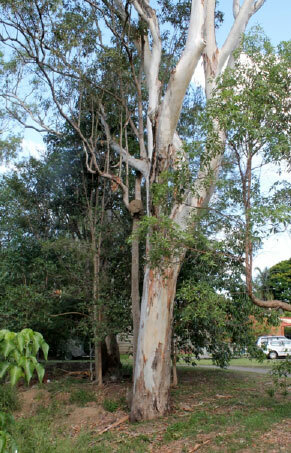 The Queensland blue gum is an evergreen tree that grows 18–46 metres high, with a trunk that can be up to 1.8 metres wide. 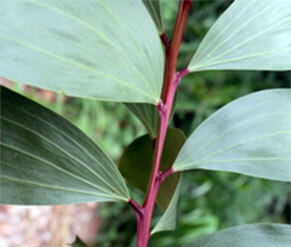 The tree is native to eastern Australia and upwards into New Guinea and Papua. 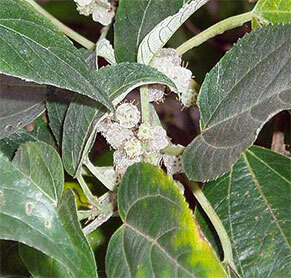 It is a koala food tree and an important source of pollen for bees. The flowers and fruit of the forest red gum attract many birds and hollow branches provide nesting sites for local wildlife. The river she-oak is a narrow tree that grows anywhere from 15-25 metres tall. Occurring naturally along the banks of waterways and rivers around South East Queensland, the tree has fine pine-needle like foliage and deeply fissured bark. Fallen foliage from the river she-oak reduces other plant growth, making this tree a useful pioneer plant. A pioneer plant is one that can grow in harsh conditions and in poor soils but can improve the area where it is growing and make it suitable for other plants to grow. 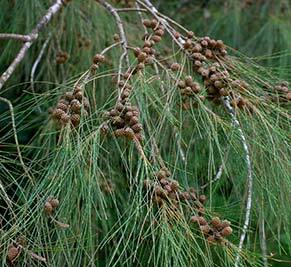 This Casuarina species are also a food source of the larvae of hepialid moths and attract a variety of birds. River she-oak trees are also useful because their root systems can help to reduce stream bank erosion. With a starting height of around 1 metre and growing up to around 5 – 6 metres tall is another layer of plants called the understorey or midstorey. Plants in this layer are those that grow under the leaves and branches of the canopy and above the groundcover. Understorey/midstorey plants can differ greatly from area to area and are generally a mix of young trees, small trees, shrubs, and soft-stemmed plants. They grow in the shade of the taller, canopy trees. It is sometimes very dark for the plants living underneath the canopy. Because of this, you will sometimes find that the leaves of understorey/midstorey plants are very large. This feature helps the plant to absorb or soak in as much sunlight as possible. The understorey/midstorey layer of Fish Creek habitat is important. Many thousands of insects and birds live in and amongst this level of plants. Understorey/midstorey plants provide animals with food, shelter, camouflage and a home to live. They also help to improve the health of canopy trees. Black wattle is a tall shrub or small tree that grows up to a height of 10 metres. It grows in sandy or stony soils over most of South East Queensland and surrounding areas, including New South Wales. Wattle is a great plant for the environment. It can grow in disturbed sites where the quality of the soil is very poor. Wattle trees are very useful. Some types (‘species’) of wattle are grown so the wood can be used to build furniture or houses. Some species of wattle are grown because their bark can be used to make glues, dyes or medicines. Other species of wattle are grown for their beautiful leaves and flowers or for Bush Tucker. 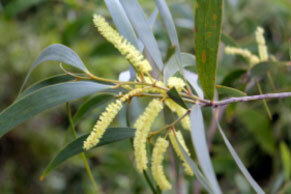 Black wattle’s bark has been used in the past to create a medicine to treat coughs. The young roots and seeds from this plant are also Bush Tucker. The wood of the black wattle has also been used by Indigenous Australian peoples to make weapons and tools, including boomerangs. Many different species of butterflies are also attracted to the black wattle, including the Blue Jewel butterfly (Hypochrysops delicia), Emerald Hairstreak butterfly (Jalmenus daemeli), Common Imperial Hairstreak butterfly (Jalmenus evagoras evagoras) and Stencilled Hairstreak butterfly (Jalmenus ictinus). Native mulberry is a straggly shrub or small tree that grows to a height of 6 metres. It naturally grows in subtropical, dry and riverine rainforest areas from Northern New South Wales and up into North Queensland. When it has access to a good water supply, the native mulberry will grow very quickly. Because of this, it is often used as a pioneer plant. A pioneer plant is one that can grow in harsh conditions and in poor soils. It improves the area where it is growing and makes it easier for other plants to grow. 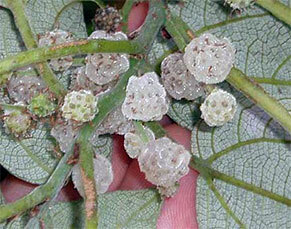 The flowers of the native mulberry are used by adult butterflies for nectar. The tree also produces small, sweet, soft fruit that can be eaten as Bush Tucker. As well as being a food source, this plant has several important uses in Aboriginal culture. The bark of the plant made a useful brown dye, the fibres were used to make cloth and the inner bark was/is used to make fishing lines and fishing nets. The plant also acts as a host for several different species of butterflies and other insects. Queensland ebony is a small tree of around 4 – 6 metres that grows in dry and sub-tropical rainforests. The bark of mature trees is a dark, blackish colour as well as being fissured and scaly. The tree produces a yellow, oval edible fruit. If you happen to be out-and-about and see this tree fully-grown, it is usually a sign that you are in a healthy habitat. This is because the tree is very slow growing and does not compete well with weeds. The river bottlebrush can grow quickly and reach a height of around 10 metres. The small tree or tall shrub is able to grow in heavy, waterlogged soils and in shady, wet environs. 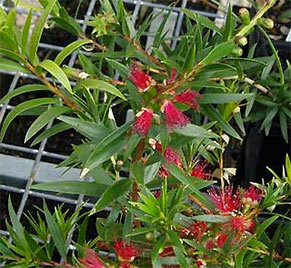 Once established, the river bottlebrush can also tolerate long periods without rain. River bottlebrush is often used in landscaping as a screen plant, for erosion control or sometimes as a street tree, where it is able to tolerate smog and pollution. For a riparian habitat like Fish Creek, the river bottlebrush plays a very important role because it can help to stabilise creek banks. The plant is also a source of nectar for many species of insects and birds. Groundcover layers of plants include grasses, shrubs, sedges and forbs. All these plants grow to less than 1 metre high. They are smaller than the understorey layer of plants. They are vital for stabilising the top 30cm of soil by making sure it does not wash or blow away. 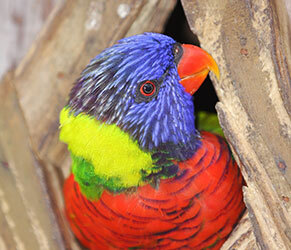 They provide nesting sites for small animals including birds, reptiles, insects and frogs. They produce seeds that can feed small birds and provide a safe place for animals to hide from predators. They help to stop the ground from drying out. They help to improve the health of plants growing in the understorey and canopy. As a shade-loving plant, the binung fern can be found growing along creek banks, in rainforests, or in open forest. Binung ferns are a useful plant to use when restoring Fish Creek as the plant is able to control weed growth by quickly covering an area. The blue flax lily is a native plant found in many different regions across Australia. The lily has straight, strappy leaves and can grow to around 1 metre tall by 2.5 metres wide. 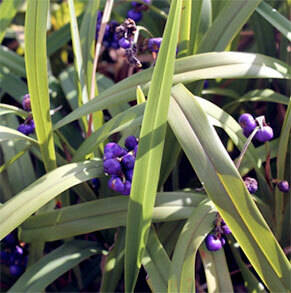 Blue flax lily produces blue, star shaped flowers on long stems in spring followed by edible purple berries. The berries have a sweet, nutty flavour, although it is recommended they only be eaten in small amounts. 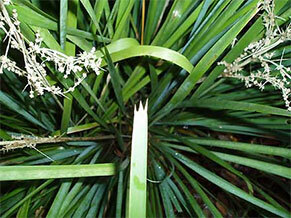 The strappy leaves were used by Indigenous Australian peoples for weaving and creating string. 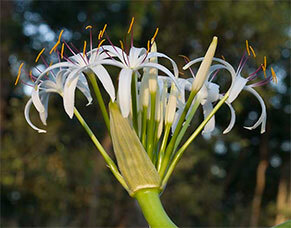 The Brisbane lily is a pretty plant with strap-like fleshy leaves that can grow up to 1metre long. The lily is shade tolerant plant and has beautiful, large white scented flowers over the summer months. Brisbane lily is useful to plant along creek edges as it can tolerate dampness. The plant is fire-retardant and it attracts many different types of birds and butterflies. Growing to 1metre in height with clumping, long, flat leaves, examples of the long-leave matrush can be seen all around The Gap, South East Queensland. 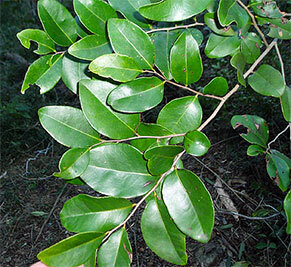 This plant also grows in many different habitats including creek banks, coastal dunes and in rainforests. By splitting and soaking the leaves of this plant, Aboriginal peoples made net bags and traps for fish. The long-leaved matrush is also Bush Tucker, with the white leaf bases tasting like raw green peas. As a hardy plant, the long-leaved matrush can also act as a pioneer along waterways, like Fish Creek. A pioneer plant is one that can grow in harsh conditions and in poor soils. It improves the area where it is growing and helps to make it suitable or other plants to grow there as well. The prickly rasp fern grows in a variety of habitats including eucalypt forests and rainforests. 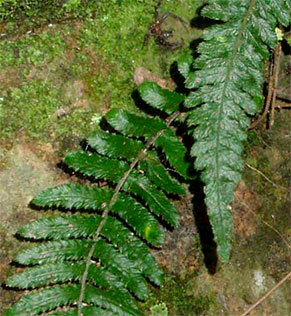 At around 20 cm in height, the fern grows in Queensland, eastern New South Wales and in eastern Victoria. 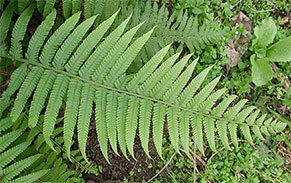 The fern is very hardy and can handle some direct sunlight (unlike some other species of ferns). Prickly rasp fern is sometimes used as a pot plant because it has lovely pink/red shoots that appear when the plant is actively growing. The star goodenia is a perennial herb with rounded leaves, growing to around 50 cm tall. It can be found growing naturally in coastal and tableland regions of southern Queensland and in New South Wales. 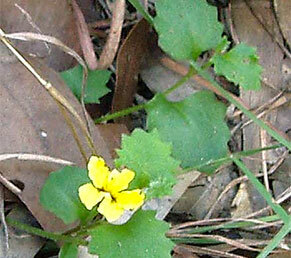 The star goodenia is a groundcover that likes to grow in light shade. It is a food plant for some types of caterpillars and has yellow flowers during the summer months.